Parents, how are you coping with the school summer holidays so far? We've given you a few suggestions to keep the little tykes busy, and hopefully you're managing fine. But with the typically unpredictable British weather playing games with our emotions yet again, how can you keep the kids entertained and active both inside and out? 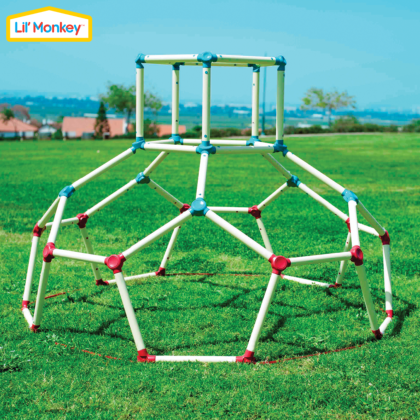 We've found the answer in the form of the Lil' Monkey Dome Climber from TP Toys. ere are the headlines: this is a climbing frame that can be used both indoors and out... that is entirely made from plastic. "Plastic?" we hear you shout. "And you expect me to let my kids climb all over it? Fat chance!" Don't worry, because that is exactly what we thought when we discovered the climbing frame was plastic. But this is a very clever plastic, designed in a very clever way. With a very clever special feature. The Lil' Monkey Dome Climber is constructed from several dozen plastic tubes, all of the same length. There are then about five different kinds of junction parts onto which the tubes attach. 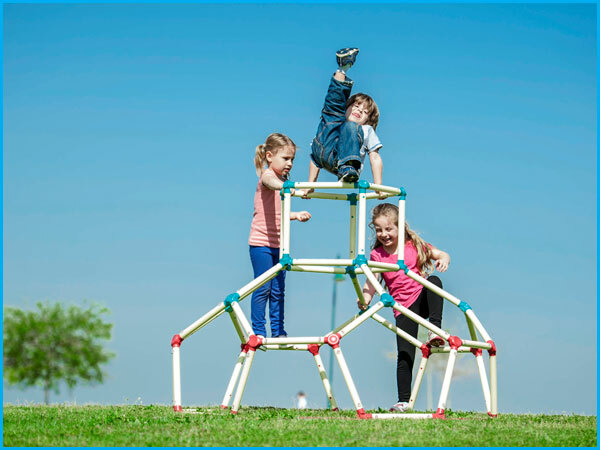 It is a fairly simple job of assembling the climber, starting from the ground up with the 'A' junctions, building five pentagons to form the first layer. The tubes firmly click onto the touch junction parts and utilise little safety catches to lock each piece together. Once complete, the Lil' Monkey Dome Climber is remarkably sturdy. Just pressing down on the structure with our many adult hands showed that it was extremely strong, despite being a hollow dome. Although not strong enough to support an adult's weight, the Lil' Monkey Dome Climber can happily suspend a weight of up to 80 kg, so around three young kids. The first time the wee ones scaled the climbing frame, we watched with some trepidation. The whole thing flexes ever so slightly under pressure, which is actually the secret to its strength, but something first-timers have to get used to. Meanwhile the kids couldn't care less - they were having way too much fun. So a very clever piece of design and engineering... but there's more. 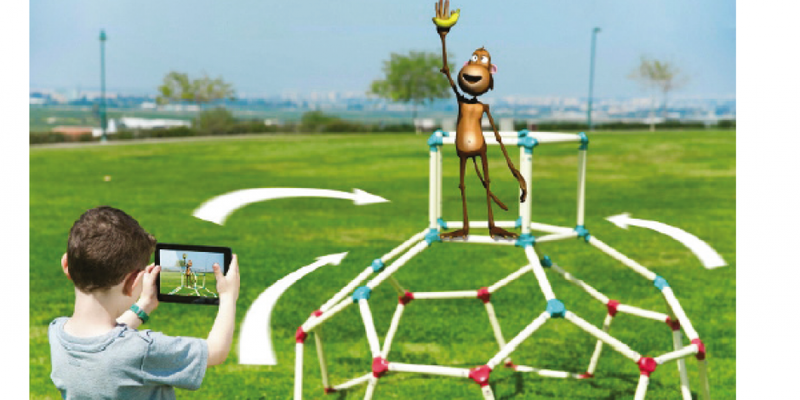 TP Toys have ensured that the Lil' Monkey Dome Climber is also appealing to those kids who dabble in the digital realm. The associated free app, available for iOS and Android, can be used to enhance the fun of the climbing frame thanks to a very nice augmented reality feature. Point your phone or tablet (while running the Lil' Monkey app) at the climber and you'll see a playful little monkey climbing all over it. This cartoon chap can even interact with the kids on the frame, as the app can track where everyone is while climbing, moving the monkey appropriately. The app is fun, and there is a game element to it as well, as the kids can follow the monkey around the Lil' Monkey Dome Climber, going where he instructs. To be honest though, our kids soon tired of this, preferring just to play and climb as they saw fit. Typical. Still, it is a very nice addition to a very nice summer activity. The Lil' Monkey Dome Climber by TP Toys is quite remarkable : parents can quickly assemble a full-sized climbing frame from a relatively small box in mere minutes - one that can also be enjoyed inside, while kids can let their imaginations run riot as they play, swing, and dangle all day, with or without a the app.